One of the best things about being a member of a church is the way people take care of each other, just like a real family. Our church, Northside United Methodist in Brewster, is one of the most caring churches I have ever encountered. When a family we all love faced a recent crisis, a food chain was set up so that every night for a week someone different would deliver them dinner. Our night was Sunday. Other people had already brought lasagna and meatloaf, so I decided to make the most comforting meal I know – and one of the few things that all of my children love: Chicken and Biscuits. This was a frequently served dish in my childhood because (as my mother used to say) you can feed a whole crowd with just one chicken. 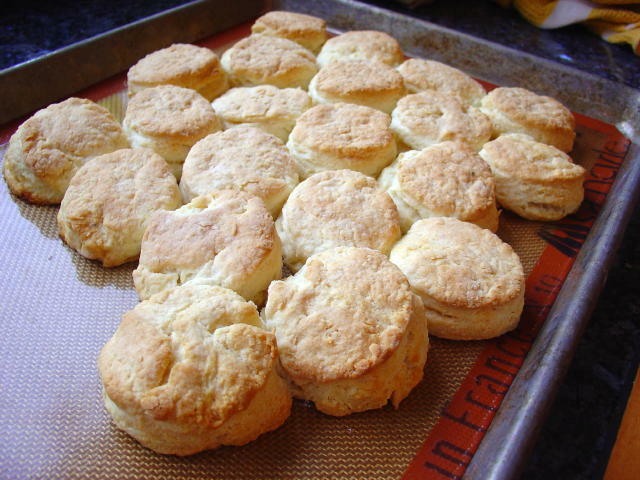 Her version is just chicken and gravy served over homemade biscuits and that’s the way my son Tommy likes it best. The rest of us like some more flavor so I add onions, celery, carrots, and peas to the mix and just strain fussy boy’s gravy over the biscuits and add the chicken on top of his individual serving. While I spent the afternoon cooking, I kept the family in my thoughts and stirred some prayers into their meal. After I made the chicken stew, I made a double batch of biscuits and a big Greek salad with calamata olives, feta and pepperoncini. My sweet hubby made a big pan of apple crisp for dessert and picked up some vanilla ice cream. Food nourishes the body and soul and when a crisis hits, sometimes all you can do for others is give them a hug, pray for them, and make them a nice meal. Rinse chicken and place in large Dutch oven. Add 3 cups water or chicken stock and bring to a boil. Turn down heat to low and add onion, celery, tarragon, parsley, salt and pepper. Simmer over medium low heat for a half an hour. Add the carrots. Cook for another 30 – 40 minutes. Take chicken out of pot and let it cool slightly before removing the meat and cutting it up. Add the peas to the pot of stock and bring to a boil. Make gravy by shaking up 1 3/4 cup of water with 1/3 cup flour in a gravy shaker. Shake vigorously until all lumps are gone. Slowly add to the boiling stock and veggies, whisking constantly until it is the consistency you prefer.